In my opinion grilling a Thanksgiving turkey is the best. Not only does it free up space in the oven but grilling gives it a great flavor. When you are grilling a turkey you should aim for a turkey in the 14-18 lb size range. I just bought a 20 lb turkey and it just barely fit in the Weber Kettle. It’s such a tight fit that I’m going to use the Weber rotisserie ring to give some extra height to the kettle. A bird in the 14-18 lb range will also cook very quickly on the grill. When using a standard charcoal kettle I set up indirect heat as shown in the above photo. 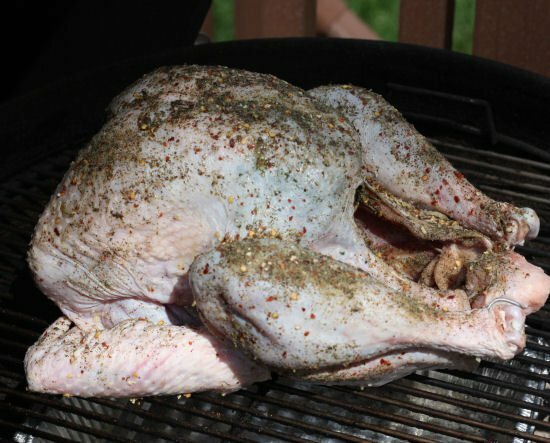 The bird will sit directly on the grate and the drip pan will help keep your grill from leaking turkey juice. The charcoal is put on the left and right side of the drip pan. I fill about 3/4 of a charcoal chimney with coals and ignite it. I then will dump equal parts on each side of the drip pan in the Weber indirect coal baskets. I like to let the grill heat to about 400 degrees before putting the turkey on. This means 400 degrees on the grill thermometer which is located at the top of the dome. If you obtain this heat a 16 or so lb bird should take approximately 2 hours. Yes, only two hours. My notes from previous cooks show that after two hours the temperature will drop in the grill to about 300 degrees. That’s ok, but you can get yourself into trouble if for some reason your turkey isn’t done after a few hours and your grill is 300 degrees. That will add a lot of time to the cook. I suggest adding a few handfuls of unlit charcoal to each indirect cooking basket about halfway through to keep the heat going. This method works really well. 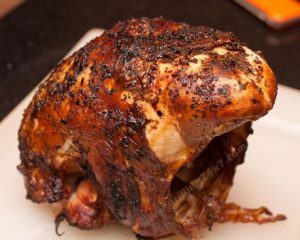 One thing you also want to do is put some aluminum foil under the turkey legs to prevent them from burning. Depending on the size of your grilled turkey the legs might be awfully close to the charcoal basket. They will brown and burn much faster than the breast and top of the turkey. About 30-40 minutes into the cook just add some foil on the sides of the legs as a heat reflector. This works perfectly. Not cooking for a whole group of people? You can easily cut down on the amount of food by just grilling a turkey breast for Thanksgiving. A breast will take about 2 or so hours just like a regular turkey. One advantage of cooking just a breast is that you don’t have to worry about burning the legs and wings and it also gives you a lot of extra room on the grill. 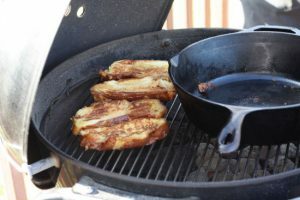 You can cook some potatoes or something else on the grill as well. You might also be able to find a larger size turkey breast and end up with more breast meat than if you had a full size turkey. Also, these breasts are usually really expensive but now is the time to stock up as they are probably on sale. 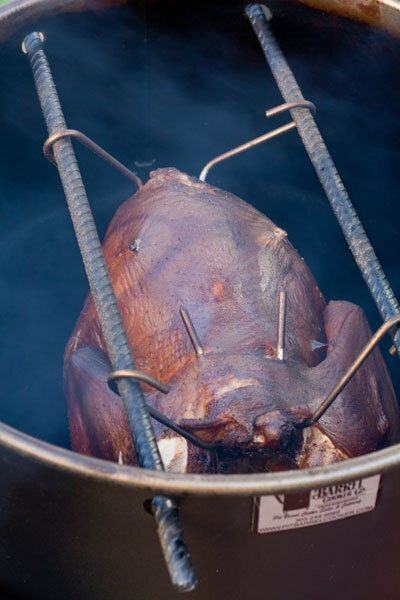 One new method of cooking a turkey that I really like is to hang it from hooks on the Pit Barrel Cooker. I just recently did a review of the Pit Barrel Cooker and it’s a really nice 30 gallon drum with steel bars across the top. It comes with hooks and you can hang a turkey! Very unique! One other thing that is crucial is flavoring your turkey. You can do this by brining, injecting and/or rubbing. If you want to try a brine I suggest Alton Brown’s Turkey Brine. I’ve done this method once and it is an amazing turkey. What I don’t like about a brine is that it is a mess and it tends to make the turkey meat a bit gooey. I also don’t like having to pull out a 5 gallon bucket and fill it with a raw turkey. I’ve even tried lining the bucket with multiple trash bags. It never fails, the bags leak and I end up with a raw turkey mess. No thanks. My preferred method of imparting flavor and tenderness is the butter injection. You simply melt some butter and mix in some popcorn salt. You stir it up and inject it all over the bird. This provides a unique buttery flavor to the turkey. The injection also seems to help keep the turkey tender. However, in my opinion most of the tenderness comes from not overcooking the bird. 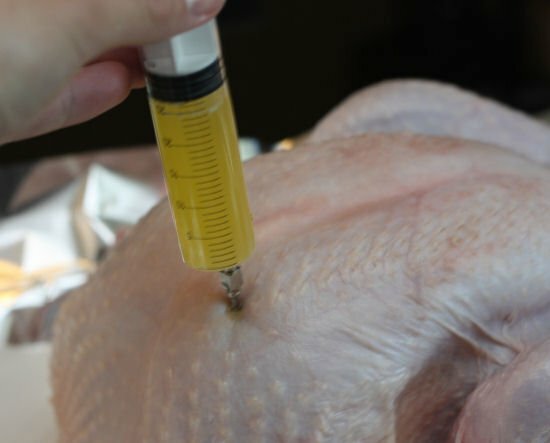 It’s very easy to use an injection for your Thanksgiving turkey. These little injection sets cost under $5 and are found in most grocery stores. Lastly, I like to use a poultry rub that I got from a Steve Raichlen cookbook. It is very simple but very flavorful and spicy. The rub is simply 1 tablespoon each of parsley, salt, pepper, red pepper flakes and dry onion flakes. 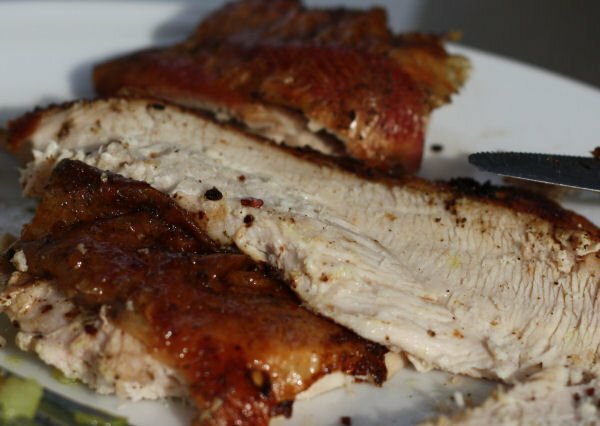 The recipes and instructions for this injection and spicy rub can be found here. 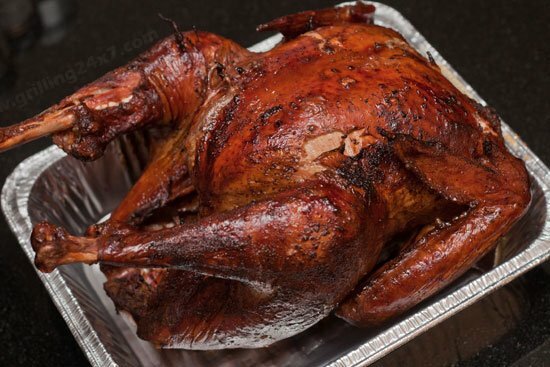 The last and probably the most important thing about grilling a Thanksgiving turkey is “what temperature is the turkey finished cooking?” This is the internal temperature of the bird and is crucial to not only a good turkey but also a safe Thanksgiving! I believe the USDA has backed off on their cooking temperature over the past years and some people now like to cook the turkey to only 155 or 160 degrees. I find that this isn’t the way to go. Thermometers can vary and temperatures will also vary depending on where and how long you insert your thermometer probe. I like to cook a turkey to 170 degrees. When I grill a turkey to 170 degrees in the breast there usually isn’t any pink at all near the bone. Mrs. Grilling24x7 will have a fit if the turkey has any pink inside and from experience I still see pink when the breast registers 165 degrees F.
The guys at Butterball provided this turkey cooking guideline chart. It is for a 325 degree oven, so that is a bit lower temperature than what I recommend on the grill. 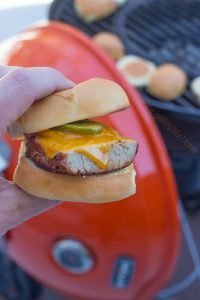 Starting a grill at 400 degrees and allowing it to dip down to around 300 by the end of the grill will give you a bit faster cooking times. Use the above as a general guideline but realize that if you decide to smoke a Thanksgiving turkey at 250 degrees or so you’ll take much longer than what is described here. If you weren’t planning on grilling your Thanksgiving turkey I hope reading this has changed your mind! What could possibly be better than sitting outside next to the grill while your turkey cooks for a few hours on Thanksgiving day. Let all the family hangout inside to do their thing and sit back and smell the smoke for a few hours! That’s what I’ll be doing.